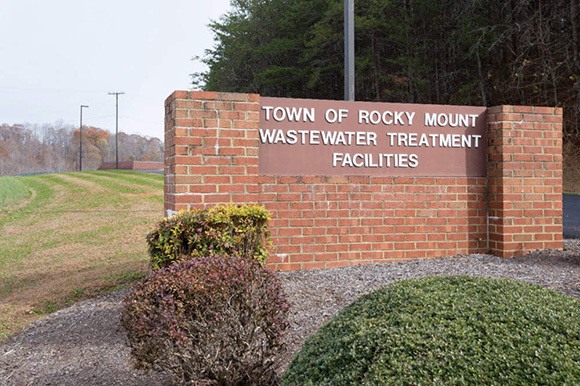 In a recent edition of Treatment Plant Operator (TPO), the Rocky Mount Wastewater Treatment Plant shared that cross-training, and a wealth of experience in wastewater treatment by their team members allows them to be highly self-reliant and do most of their own maintenance. It is this confidence in their capabilities and their treatment process that earned the facility the designation as a benchmark plant for its maintenance practices and performance record by the Virginia Department of Environmental Quality. Two TrojanUV systems disinfect the effluent at the plant located in the Blue Ridge Mountain region of Virginia. Tim Burton, Plant Superintendent, gives credit to UV disinfection for his ability to save money and assure a near-100% pathogen kill rate. The plant first adopted UV disinfection in 1994, after a conversion from chlorine. Two channels of TrojanUV3000™ equipment were installed; each channel had a capacity of 3 MGD and was designed for alternating use. In 2012, one of the channels was upgraded to the newer TrojanUV3000Plus™ system which has yielded significant operating cost savings (for cleaning and electrical costs). “The older units have 192 bulbs and a capacity to treat 3.0 MGD, whereas the 3000Plus channel has two units with 24 bulbs each, and each unit is capable of disinfecting 3.0 MGD," says Burton. 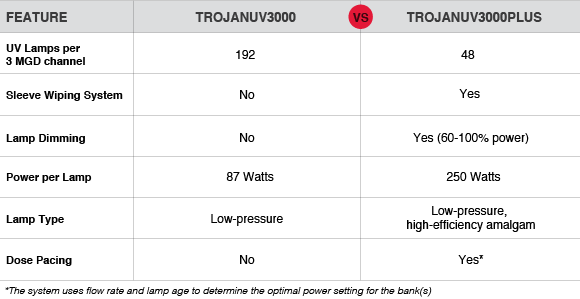 The TrojanUV3000Plus is one of the reasons why UV treatment is now a favored technology in wastewater treatment. This highly flexible system has demonstrated effective and reliable performance in thousands of installations around the world. It is well suited to wastewater disinfection applications with varying flow rates and influent, and offers dependable performance, simplified maintenance and maximized UV lamp output at end-of-lamp life.